By his own admission, Todd Gieg is obsessive. He’d have to be. The professional photographer is recreating about 10 miles of train track and every town along it in miniature. It’s part-education, part-community, part-labor of love—a project he hopes will figuratively bring the 1895 Massachusetts North Shore back to life. Shortly after moving to Lynn, Massachusetts, Gieg bought a basic model railroad kit for his son. At the same time, he began delving into the history of Lynn and the surrounding area. He found that a now-defunct narrow-gauge railroad had once carried freight and passengers along the area’s Atlantic Ocean waterfront. Narrow-gauge tracks are narrower than standard train tracks. They were (and in some cases still are) often used in areas where money was scarce and potential riders few: the Maine woods, the Rocky Mountains, the Swiss Alps. The Boston, Revere Beach, and Lynn Narrow Gauge Railroad was an exception. In its heyday, the railroad carried over seven million passengers a year. From 1875-1940, the railroad carried Bostonians from bustling Beantown to several seaside resorts—Point of Pines, Revere Beach, and others—known together as the North Shore. 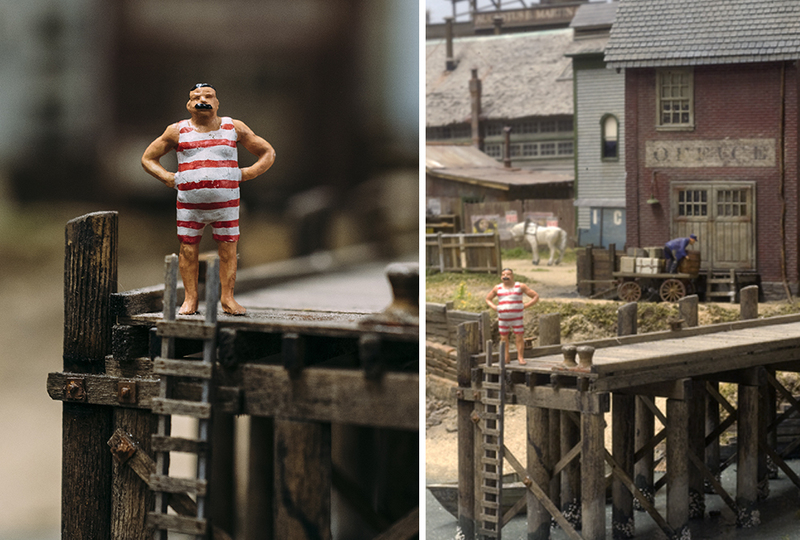 Soon Gieg went from building a simple model railroad to constructing a scale diorama, or model. “I believe a sense of one’s community is enhanced by an awareness of its history,” he says. 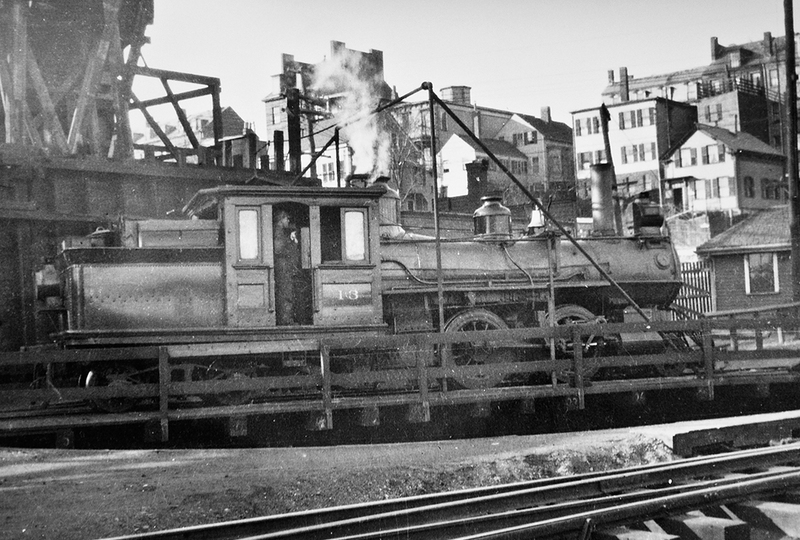 Gieg’s website calls the Boston, Revere Beach, and Lynn Narrow Gauge “Boston’s forgotten railroad.” But if Gieg has anything to say about it, this railway will be remembered for a long time. 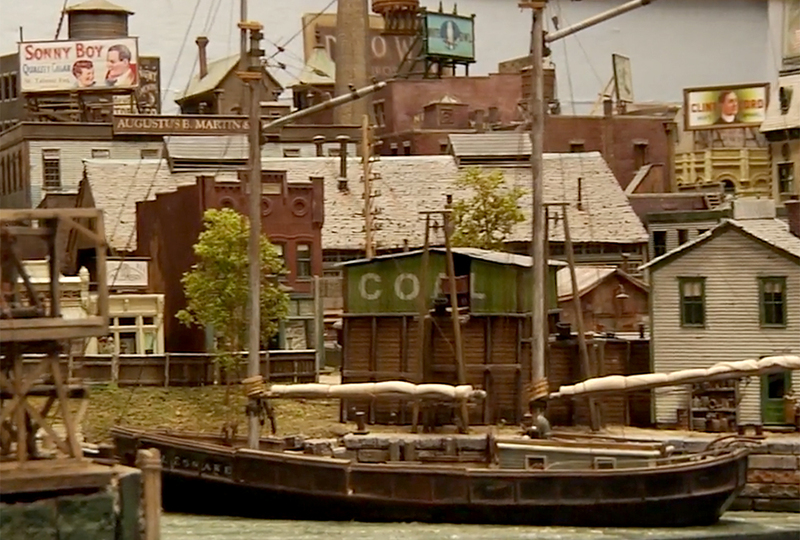 With nearly endless patience, Gieg began recreating a miniature 1895 Lynn, Massachusetts. He includes details down to faux ivy crawling up buildings, tufts of grass sprouting under porches, and meticulously recreated storefronts, houses, and factories. Gieg’s plans include 10 four-by-four-foot modules—the entire distance from Boston to Lynn. Gieg studies old maps, books, and photographs. He interviews folks who rode the railroad as children. 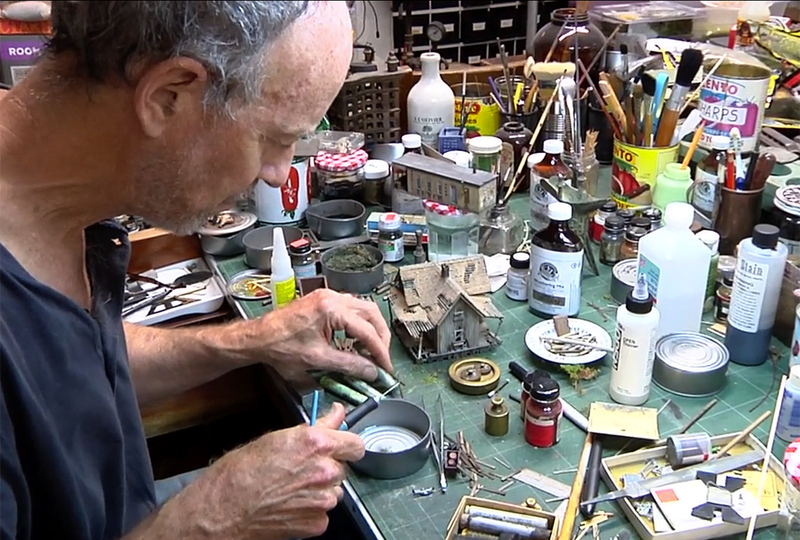 Many of the diorama’s structures, ships, and trains are assembled from kits. But Gieg “scratch built” almost a third of the buildings, relying on research and makeshift materials to reproduce 120-year-old homes and shops. Gieg mixes special paints, carves fenceposts, strings wires, and constructs warehouses. Signs and billboards advertise “Toilet Masks” and “Fels-Naptha Soap” from the rooftops. Gieg experimented with coloring and texture until he was satisfied he’d crafted realistic-looking water. Jars marked with granular mixtures are labeled “fine turf green” and “coarse turf.” They provide him with the material he needs to fashion grass. “My desire is to have the craftsmanship evident in the diorama inspire kids to put down their phones and rediscover the pleasure of doing something with their hands,” he says. Over several years, Gieg has built more than 50 models for the diorama. They range from small boats and coal barges to a “gasometer” storage tank and rows of buildings lining Market Street. He insists on precision and detail. He relies on maps and plot plans to achieve historically exact placement. 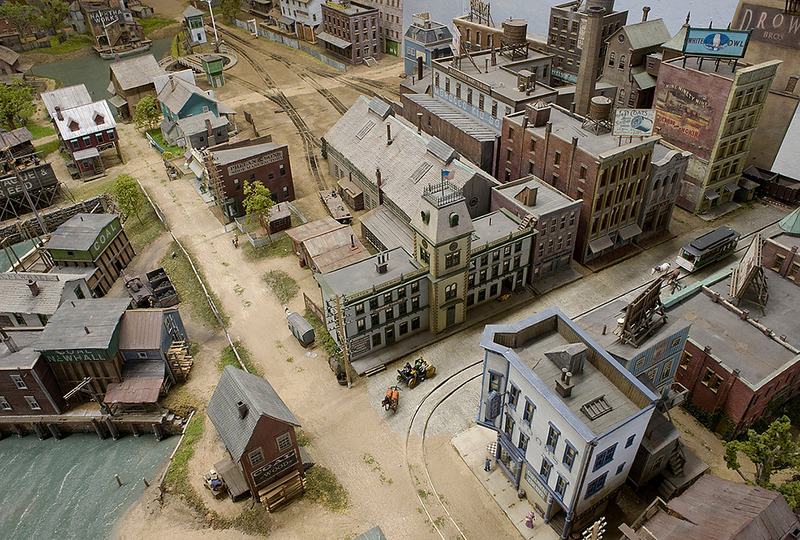 Imagine making each board, tree, fence post, brick, and rail of a 40-foot diorama by hand. Then think of what a tiny part of the world Todd Gieg is copying—not creating from nothing! God the Creator planned the details of every cell in the universe. He spoke them into being without consulting a single book, website, map, or photo. “I have been successful at this because it is pleasurable,” Gieg says. God took pleasure in His creation too. He called it “very good.” (Genesis 1:31) It is right and good to use God-given creativity and intelligence to build and teach and delight and communicate—so long as we remember from whom all blessings flow. That is neat! That would be cool to see it once it is finished. Wow! That is a huge project! I saw the pictures. That is so awesome. I would like to see it in person. looks so real from the pictures. I'v seen one of these before they would be sooo hard to make! I would love to see it in person! that is amazing I want to see that in person!!! Who else doesn't have a phone? i dont have a phone? The article said they used narrow gauge rails, I wonder if he actually made his own track. If it is manufactured it must be rare, expensive or both. that's awesome, I would never be able to finish a project like that! that would be fun to play with. I wonder how he has the patience to do that. I would get bored if I started a big project like that. But that's just AMAZING!!!!!! We are working on a train set but not with that much deatal! I don't have a phone. Why? That is really big!! I mean 10 feet long! You would have to be really committed to do that kind of work. I am definitely not patient enough for that job! :) And It is so detailed! Just look at the slide show! that dude needs to get a life. he should totally sell the diorama! I don't have a phone either, why?